Captain Charlie (チャーリー? ), also commonly referred to as Charlie, is one of the three new playable characters in Pikmin 3. He wears a spacesuit with a green lapel and a star-shaped badge on its left side. He has an average-sized nose, a dark brown mohawk and a tiny mustache, and like Alph, has eyes that are wide open at all times. His skin is also the most tan out of the three explorers. He, along with Brittany and Alph, come from the planet Koppai in search of a new food source for their planet, and serves as the captain of their space-faring vessel, the S.S. Drake. He also takes a rubber ducky with him on every mission for good luck. Charlie is revered as a hero on Koppai. Alph even describes him as "one of Koppai's greatest legends". Charlie is the first character to be played as, and is the farthest away from the ship. After encountering Yellow Pikmin, and introducing all the controls, he goes into a cave where he encounters the offspring of the Vehemoth Phosbat and defeats them, thereby angering the mother. Shortly after this encounter, he is attacked after a strange shadow is seen flying around him. He is later recovered in the Distant Tundra by Alph and Brittany when they defeat the Phosbat. His crash site is found later in the game by Olimar, as suggested by a data file found in the area. In game, Charlie plays the same as Alph and Brittany. When Pikmin 3 was translated for European audiences, his personality had been kept mostly the same, but after the game was ported to America, Nintendo of America changed most of his personality for unknown reasons. Charlie is shown as a very capable, level-headed leader and shows a lot of care and a sense of protection towards the people he loves and respects. In some reports it's revealed that he prefers to stay vigilant near the S.S. Drakes door to protect his crewmates and greatly appreciates their presence, since he was often alone in space during his youth as a ranger. Charlie also shows great interest in the natural landscapes of PNF-404, as he considers the beauty of the plants and flowers to have moved him in a way that's difficult to describe. Charlie also seems to have a really keen interest towards ducks, demonstrating a lot of knowledge about them, owning a Rubber Ducky as a lucky charm and having a pet duck named Elizabeth whom he describes as his soulmate. There are many parts in the game's story where Charlie tries to show his deep affection towards Brittany, only to be interrupted by some other, pressing matter. His crush on Brittany is further accentuated in several reports where he plans to collect a few flowers as a present for Brittany and where he describes that, if he has to throw a crew member, he would always choose Alph first because "You shouldn't throw away the things you love..."
The reasoning behind this was unknown. "I've arrived at the destination!" "Sorry for the hold up!" "Arrived at the destination! Over!" "Curses! This is no good!" "And where am I? Oh, right. PNF-404!" "This is Charlie speaking. Do you copy? I repeat, this is Charlie, your Captain. Come in!" "I seem to have come out unscathed, but I'm not sure about the rest of my crew." "For now, my immediate concern is to locate my two other crew members." "Uh-oh... I seem to have wandered into a strange neighborhood..."
"What’s this? They came towards me!" "My whistle will scare them off." "I can sound it with ZR/B." "Aim at them with the pointer, and blow the whistle." "Maybe I should throw them!" "I can’t let it end like this!" "I can throw them using A." "Argh, give me a break!" "They keep staring at me!" "They’re just glued to me!" "I’ll shake them all of at once!" "Well, they don't seem to be hostile. So let me get this straight..."
"I can round these creatures up by pointing at them and pressing B/ZR, then I can throw them with A." "Finally, I can dismiss the whole group with (nunchuck shake)/B." "Maybe these fellows can be of some use..."
"This planet’s mushrooms are huge…"
"Right! That's how it's done!" "I should look around for my crew!" "Pressing Z/ZL will let me see what's in front of me." "Look, there's even more of them!" "The light's scaring them off..."
Charlie appears as a trophy in Super Smash Bros. for Wii U. 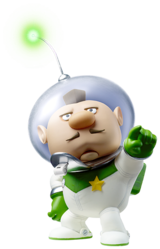 One of Alph's alternate customs also sports a green color scheme, reminiscent of Charlie. This alternate custom is present in the 3DS version too. “Charlie is the leader of a group that crash-lands on PNF-404. After he comes to, Charlie takes a look at his snowy-white surroundings and then tries to contact the rest of his crew, Alph and Brittany, with his KopPad. Getting no response, he starts walking and spots some small creatures. Hurrah! Some yellow Pikmin! “Charlie is the leader of the group that crash-lands on PNF-404. After the crash, he wakes up alone in snowy surroundings, and then uses his KopPad to try to make contact with the rest of his crew. When he gets no response, he decides to start walking and spots some small creatures. Hurray! It's some helpful yellow Pikmin! Charlie's name is derived from the term used for the letter C in the phonetic alphabet. This makes sense as Alph (Alpha) is also used for A in the phonetic alphabet; the initial of his name is also the same letter of his prototype name (Character C), just like Alph and Brittany. Artwork of Charlie commanding three Pikmin. Alternate artwork of Charlie commanding three Pikmin. Early concept art of Charlie (labeled C). Early screenshot of all three leaders. Charlie waking up in the Distant Tundra, post-crash. Charlie encountering the Yellow Pikmin for the very first time. Charlie's final, horrified expression before being swallowed by the Vehemoth Phosbat. Charlie after being rescued by Alph and Brittany. Charlie using his KopPad to communicate with the S.S. Drake. Due to the fact that Charlie and Alph land in separate areas, Charlie meets Yellow Pikmin rather than red ones like Alph. However, he does not discover their Onion, so they are not formally introduced until later on. Captain Charlie led three missions prior to Pikmin 3, named Operation: Rubber Ducky Up A Tree, Operation: Beached Rubber Ducky, and Operation: Rubber Ducky Stucky. This page was last edited on April 13, 2019, at 18:38.